The natural successor to past greats such as, say, Ike Quebec, Zoot Sims or Don Byas he brings the songs' qualities to the fore - qualities that some of the composers themselves probably didn't realise their 'babies' possessed! Magical tenor playing that, despite the age of the material, sounds as fresh today as if I was hearing it for the first time. 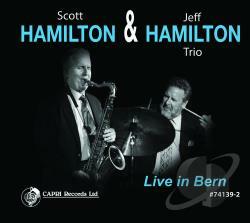 Recorded live in Bern, Switzerland, by Capri, the two Hamilton's swing like as though it was going out of fashion! Believe you me, going by this record, it's very much back in fashion! Hamilton [Jeff] is described as a 'drummer's drummer'. Yeah, maybe, but I think Scott would describe him as a 'drummer for all sessions'. He keeps Scott on the ball throughout - not one fumble. Then there's Hendelman - as good a piano man as you'd want on any gig. His comping is on the money every bar of the way and his solos would make the album worthwhile even if Scott hadn't been there! But he was and this makes it just so perfect. Sorry Christof, I always leave bassists to the last but, let's face it, if you weren't there this would drop down from a 5 star record to a 2½ star one. Your work on Key Largo personified the mood of this atmospheric Benny Carter piece. September in the Rain: All Through the Night; Watch What Happens; Soul Eyes (Mal Waldron); This Can't be Love; There'll be Some Changes Made; Sybille's Day (J. Hamilton); Key Largo; Woody 'n You (Dizzy); The Champ (Dizzy)*; Ballad for the Very Sad and Tired Lotus Eaters (Strayhorn); You and the Night and the Music; Centrepiece (Harry Edison). A disc that reminds me that all is well! Released byy Capri Records on October 20.